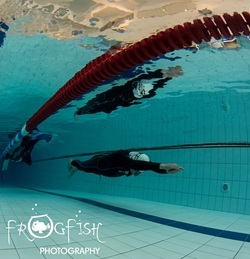 Two new Freediving pool records were broken on May 31st 2014 in the second Manchester Freediving Pool competition. It is the eleventh competition / record attempt arranged by the group from the North of England called Apneists UK, which is run by Steve Millard www.learn2freedive.com . A handful of elite athletes came from around the UK to support the event, and a few newer freedivers came to get involved in their first competition. The event was a choice of three disciplines. Breath hold lying face down (STA), swimming horizontally with fins (DYN), and swimming horizontally without fins (DNF). In this event records were seen from John Moorcroft of the Apneists UK club of 167m DNF (UK record) and Mike Benke also of the Apneists UK club of 165m DYN (Hungarian record) . The event was well received, other notable performances from Chris Crawshaw with a STA of 5 minutes 44 seconds, and DNF by Rebecca Ryan of 114 metres who came top out of the ladies.